Vuforia View may not be using the most current version of Vuforia’s ground plane technology. Therefore, your device may not yet be supported for Vuforia View. • Sequences can interfere with the phantom effect during the placement phase of the Experience. Currently, phantom rendering is applied to all models and model items that are explicitly declared in the TML. Any sequence applied to the model overrides the rendering mode for all model items in the sequence. If a model item in the sequence doesn't have a corresponding model item in TML, then it will not be rendered as phantom. For models with sequences, best practice is to wait to set the sequence for a model until placement is done, and to unset the sequence when tracking is lost. The Tracking Acquired event will be fired after you’ve left placement mode by tapping on the screen. The Tracking Lost event will be fired when you shake the device. Use these two events to set or remove the sequence from any models. • ThingView renderer must be enabled in your Vuforia View settings in order to view an Experience that uses spatial tracking. This does not apply to HoloLens. • Spatial tracking content may scale differently depending on your device. • On ARKit devices, model placement may require the device to be moved in order to initialize tracking. • On non-ARKit devices, 3D object stability may be reduced as compared to ARKit devices. • Avoid placing 3D objects on plain colored surfaces and highly transparent or reflective objects (for example, an all-white desk). Instead, place the 3D object or objects on a surface with saliency, interesting features, and texture. The following tables list properties, services, and events that are specific to this widget. Location of the Spatial Target on the x-axis. Location of the Spatial Target on the z-axis. Allows the pan gesture to be used in the Experience. Allows the rotate gesture to be used in the Experience. Allows the scale (zoom) gesture to be used in the Experience. Resets the scene to its original size and position after moving elements around with gestures (move, rotate, zoom). Triggered when tracking is initiated. Triggered when tracking is lost. 1. Drag and drop a Spatial Target widget onto the canvas. 2. Drag and drop the widgets you want displayed in your Experience. 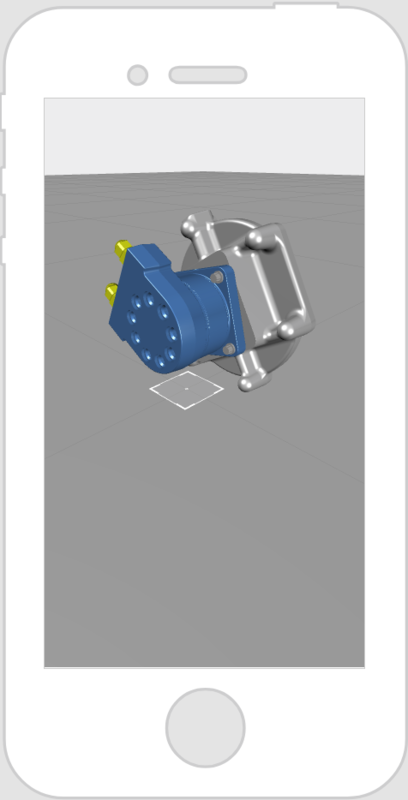 For this example, we’ve included a Model widget. 3. In the Project pane, under Configuration > Experiences, select None from the ThingMark Association drop-down. 4. Once the Experience is published, it will appear in your Library. Open the Experience, and point the camera at a horizontal surface, then place the model by tapping the screen.